While smaller staff lists heavily correlate to stronger and more polished productions as far as TV anime goes, please don’t take it as a law. Every project functions in its own way, and there’s plenty of nuance to these matters. A high number of animation directors is a much worse sign than featuring many key animators, which can simply be due to a high-motion episode or because a famous director has attracted plenty of talented peeps. And even then, some notoriously polished productions have achieved so by having lots of supervisors. Please use this data to better understand anime production, don’t draw conclusions exclusively off it. This includes virtually every full series from winter 2017, save for a few with credits so incomplete they were deemed unusable and a couple of series I considered redundant/pointless to cover again. If it’s full length seasonal anime though, chances are that it’s in there. The number of key animators is an approximation, this will always be fundamentally incomplete. That’s because rather often, in particular for 2nd KA, staff lists credit companies rather than the actual artists. I’ve attempted to compensate for that, but the full credits aren’t available. Again: the exact numbers aren’t the point! As for animation directors, this counts all of them except the chief animation director if it’s one person throughout the show – in which case I considered it a series credit rather than episode staff. Doesn’t make much of a difference, but there you go. This time I included subcontracting data. Please read my comments on the outsourcing numbers because those are very easy to misinterpret. With that out of the way, let’s go. Winter 2017 Animator Count. Full Key Animation (1st and 2nd) chart, with outsourcing data. Click to expand. Key animators per episode. Click to expand. — The key animators data is fairly straightforward, so you won’t need much help to parse it. You might have already noticed that amongst the shows requiring the least animators, there’s both extremely polished works and shows that are just painfully static and thus didn’t require all that many artists. A similar issue arises at the bottom of the list, which includes some shows that featured a bunch of movement like Tales and KonoSuba, as well as stiff ones that by no means should be averaging 40 key animators per episode. This is why I warn people not to immediately assume things based off these numbers alone, but rather to try and understand the projects themselves better through them. — There are no cases as extreme as Yuri On ICE was last season, but don’t take this as a sign that the industry is doing better – there is nothing good about stagnating at the ridiculous levels that have been achieved over the last few years. Anyone acquainted with how anime credits used to be decades ago would weep when looking at this data. The current level of output is highly damaging and flat-out unsustainable. Fully outsourced episodes and subcontracted key animation (1st and 2nd). Click to expand. — I included outsourcing data this time because people often ask how often entire episodes are subcontracted. So there’s the answer: a range of 0 (uncommon) to 6 times within one season…unless we’re talking about Onihei, produced by Maruyama’s new studio that doesn’t really have staff and thus had to outsource the process for every single episode. I made sure to differentiate between the whole process being subcontrated to another company (グロス) and simply relying on other studios to do some key animation, which as you can see is incredibly common. Next time I might add another layer to separate between outsourcing 1st and 2nd key animation/clean-up, since the latter is something even exceptional projects do. Don’t take these numbers without context yadda yadda. — Time for some very important notes about the shows that had all of its episodes produced in-house. This season actually had more of those than usual, since studios that approach projects like that happened to overlap. You might be surprised by series like Masamune-kun and Scum’s Wish being up there, but the truth is both Silver Link and Lerche want to be able to actually produce their own series. The downside to this is that they don’t really have the manpower to do so, especially when there’s multiple projects, so they end up relying a lot on other companies to animate their projects. They’re capable of maintaining the management within their own studio though, and that alone is impressive nowadays. Tales of Zestiria being up there should be less of a surprise, as ufotable’s autonomy is well-known. The studio is closer to self-sufficiency than pretty much any other major company, this full-inhouse mentality is a studio motto rather than a project thing. That said, Tales was a bit of a rushed endeavor for them so it ended up with very messy staff and outsourced chunks every week. GoHands are also chasing the self-sufficient dream, hence why Hand Shakers was entirely key animated at the studio and by their own staff to boot. Though if you’ve seen the series, I could never give you a better example of that having no correlation to a good production. And then there’s Maidragon and KyoAni, who keep on doing basically everything themselves many steps beyond what I track here. You might as well consider them part of an industry of their own. Average number of animation directors per episode. Click to expand. — As I said before, the number of animation directors does have a stronger correlation with the quality of the drawings and animation. A show that simply gives up on corrections will inevitably have a lower number of supervisors though, so don’t use this as objective and irrefutable proof of anything either. Always consider context. — I suppose I should say something about Fuuka, since it stands out so brutally. As of late Diomedea projects have had fairly specific animation direction credits like the layout supervisors that might bloat the number a little bit but…no. There’s nothing even remotely normal about featuring almost 16 animation directors per episode. TV anime is still broken and only seems to get worse. I think the ‘Maruyama family’ studios (Madhouse, MAPPA, M2) are an interesting case because they tend to rely very heavily on overseas outsourcing, but also manage to maintain the number of key animators mostly within reasonable levels (by modern standards at least). Might be intentional. And yeah, I think ACCA fared better than most of the output by these studios due to its very strong fundamentals. Internally uneven but still acceptable at its worst, and very pretty when at its best. The sacrifice worked out in the end. Indeed, they practically manage to perfection the “Outsourcing to still being healthy” thing, that’s curious because they have perfectly capable staff to handle an entire series [MAPPA and Madhouse at least] by themselves, but that probably will require a better schedule than the industry’s usual one, like on the cases of The Tatami Galaxy  or Zankyou no Terror . Still a smart decision, since they can maintain schedule while giving the less important episodes to the outsourced staff and maintaing the credits -and themselves- healthy. *since they can maintain the schedule while giving lesser episodes to the outsourced staff, while the core staff is concentrated on the ones of bigger priority and maintaining the credits -and themselves- healthy. PD: Why there’s not “Edit” button on the comments? I think it also helps too that Dr. Movie is also owned by Madhouse. Because it gives the companies (save M2, for obvious reasons) an outlet to dump some episodes without having to rely entirely on multitudes of contract studios every episode. Just send it off to one company and have them do everything for you instead. That also happens on M2 actually, most of the series was outsourced to only three studios: Tezuka Productions, Dangun Pictures and DR. MOVIE, the same three studios that did most of the work on the end of Maruyama’s Madhouse era. Great work as always. Thanks for all the info. I hope you keep doing that, at least twice a year. This is great stuff. Thanks a lot! You’ve probably answered this in another place, so sorry. Why is it that KyoAni is able to have so few animators per episode? 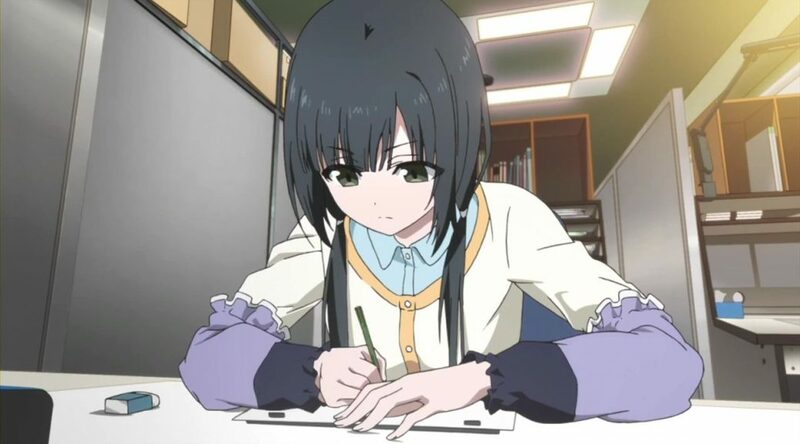 Is there any notable animators that have graduated from KyoAni’s school? Shinpei Sawa (their latest director promotion, excellent action&mecha animator) and Seichi Akitake (one of their best animation directors and usual prop designer) are both from the school. Kohei Okamura who’s been an animation director since Eupho also studied there. Likely there’s a few more people with important roles who have their origins there, but we don’t have a full list of alumni. How long has the KyoAni school been active. Since the 90s. They’ve had the courses yearly and also every 6 months, and they’re up to the 26th generation now. Are you going to do something on Free Timeless Medley soon. Like listing the storyboarders/unit directors and animation directors? There’s no point since it’ll be the same people who worked on the TV series plus maybe a couple of new animators. It’s pretty much just a recap. Do you know what happened for Blue Exorcist ep2 to only have 1 key animator? A solo key animation episode by Yonezawa. A ‘true’ solo even, with no clean-up people involved. Akiba’s Trip also had a solo (1st) KA episode but since the chart also counts 2nd KA and that needed quite a lot of clean-up, it doesn’t appear as such. Thanks for always compiling this data. Very insightful, especially with all those charts. Only about 10 key animators on average for Dragon Maid. Nice job KyoAni.